Hoosier Homemade for the Holidays! By The Cupcake Faerie on December 5th, 2011 . Filed under: Cupcake Ideas . Glitter, glitter, and more glitter! I just want these holidays to shine so that I can sing “Silver & Gold” along with Burl Ives when spinning the Rudolph soundtrack. 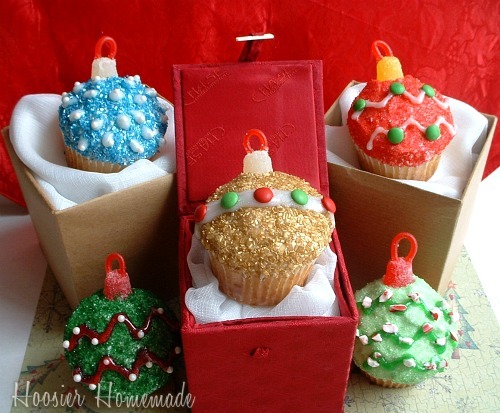 What’s more perfect to go with those silver and gold ornaments than cupcakes decorated as ornaments? These ornament cupcakes come from Hoosier country, Indiana! “Hoosier Homemade” had several holiday cupcake decorating ideas from a multi-week cupcake challenge. Find other inspiration in actual vintage Christmas ornaments. The 1950s ornaments were the very essence of elegance in design and can still be found at antique co-ops and flea markets and also on etsy and e-bay. 1 Response to Hoosier Homemade for the Holidays! 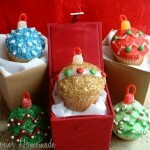 Thanks so much for featuring my Cupcake Ornaments! Merry Christmas!